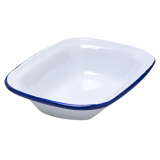 Classic retro dark blue and white enamel deep 8-inch pie dish. Crafted from heavy duty steel, this pie dish is coated with an ultra durable, fused-glass coating, giving it a tough, smooth finish. 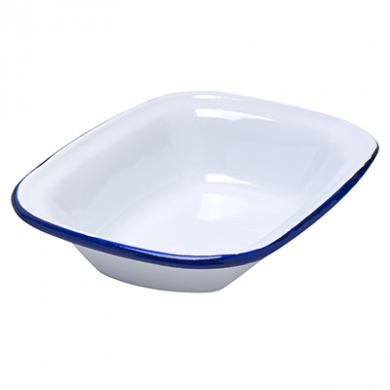 Unlike normal dishes it is designed to take on a bump or two, the chips and imperfections add to its retro look! Dimensions: 20cm x 14cm x 4cm.